Binding properties of HABA-type azo derivatives to avidin and avidin-related protein 4. Repo et. al (2006) Chem Biol 13:1029. Structural Bioinformatics Laboratory (SBL) has a unique combination of expertise where the independent groups have formed a tight network, sharing the research facilities and infrastructure. The emphasis is on multidisciplinary research aiming to solve complex biological problems related to protein structure and function, molecular interactions, and gene/protein evolution. In addition, there is very strong emphasis on education and research training in the areas of molecular structure determination combining experimental approaches (x-ray crystallography) with computation methods (molecular modeling, computational chemistry and bioinformatics). Our research nearly always involves close collaboration with experimental research groups. 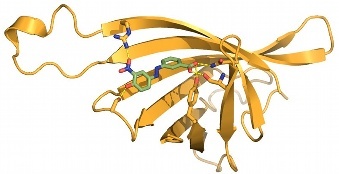 The laboratory has extensive ongoing studies on protein-ligand interactions and development of computational methods and programs for structural bioinformatics. During 2000-2005 the unit has published over 40 papers and several patents are pending. SBL is a technology platform service providing member of Biocenter Finland Infrastructure Networks. The services are usually offered as collaboration or consultation. SBL is a part of the Centre of Excellence in Cell Stress (article in Swedish) funded by the Stiftelsen för Åbo Akademi (Åbo Akademi University Foundation).